You see ads for the position of Social Media Manager. You use social media every day. Maybe you’re no designer or marketing expert, but could you be an SM Manager? What are the job responsibilities? Of course, that varies based on the employer, but here’s a quick list of some common parts of the job. Work with content creators, possibly a content manager, public relations and marketing teams. If this is a small organization, you might be a one or two-person “department” and some knowledge of photography, videography, image editing skills is a real plus. Manage all social media tactics to leverage content, drive community engagement and ultimately increase key KPIs. You will capture quantitative metrics and provide analysis and insights using SM management and analytical tools (Salesforce, Hootsuite etc.) for listening, scheduling, engaging, and reporting. on your industry, especially the social media trends of competitors. Do you need a college degree? Depends on the employer. Some may accept previous SM experience in a company – not personal social media experiences, though that certainly will help you. There are very few people in social media with degrees in social media because there are very few social media degrees though there are related fields such as marketing. You certainly need experience managing social media or relevant, digital marketing experience across social media channels including Instagram, Facebook, YouTube, Twitter, LinkedIn and Pinterest. That headline caught my attention (which is the purpose of a headline) because my business is both web design and social media. But it turns out that the author is referring to how my social media presence could hurt my chances of getting a new job or client. 70% of hiring organizations research candidates using social media, and 57% of hiring managers have chosen not to pursue a candidate because of what they found on social media. So, I guess I need to watch what I say on social media. maybe I should avoid social media altogether. No[e, that’s not a good idea because 47% of organizations won’t contact a candidate if they have no online presence. So, it’s a mixed message. Use social media the wrong way, and prospective clients will rule you out, but don’t use social media at all and they will also rule you out. Social media in general had a tough year in 2018. Criticisms of fake news, private data being sold and made public by hackers and other issues gave it a bad reputation in the general public. Even the media that uses, perhaps even relies on, social media was critical. But social media is not going away. Hootsuite made some predictions for 2020 social media (jumping right over this year) that are pretty safe bets to make. For example, based on their annual global study of internet, social, and mobile adoption across 239 countries, social media usage will continue to grow. I agree. Product discovery becomes more visual and social, according to GlobalWebIndex, because about half of internet users follow brands they like or brands they are thinking of buying something from on social media. Again, the fast-growth markets are in Latin America, the Middle East, and Africa. In the Philippines, Kenya and Morocco, social media beats the big search engines as a way to research purchasing and so it is a good bet that by 2020 search’s grip on product research will be even less. I have to believe that search engine companies are looking hard at that trend. And we know that Google never got social right. We saw the end of Google+ in 2018. Have you done searches in the past year using voice via Siri, Alexa et al? Visual and voice search are also growing and Baidu expects half of searches by 2020 are going to be through images or speech by 2020. Baidu has the second largest search engine in the world but (like the leader’s company) this Chinese multinational technology company that specializes in Internet-related services and products and artificial intelligence, is also involved in lots of other tech, such as autonomous vehicles. 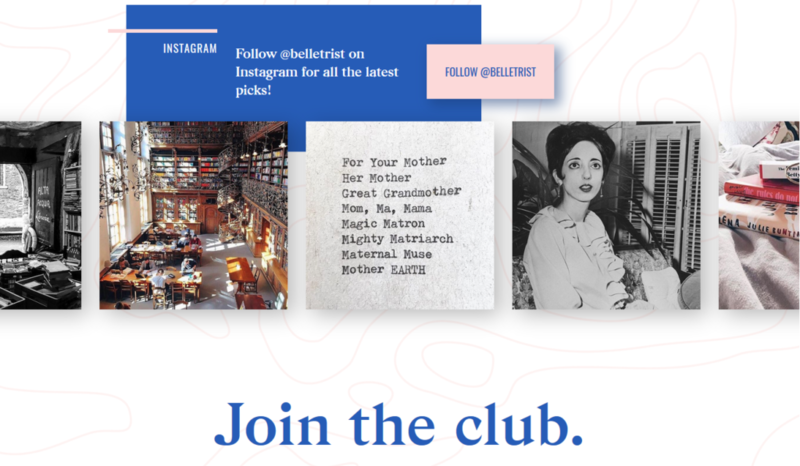 Pinterest – which I find myself using less and less – has Lens which uses machine learning for brand and product discovery and could really help broaden their reach. On the commercial user side of things, I don’t think we have really seen much innovation in areas like customer service and support using messaging apps and chatbots. That may be a 2020 trend. Some would say that social video is at a saturation point. I agree. So if it is to grow there needs to be some evolution. We know that watching videos on Facebook, Twitter, Snapchat, YouTube and Instagram is commonplace. How much of your time doing that is for social or pleasure and how much is coming from commercial and promotion? I suspect the latter uses will increase. I read that for some late night talk shows and Saturday Night Live video replay on YouTube or their own sites now accounts for 20% or more of their advertising income. It’s no wonder that Jimmy Fallon urges you after every clip to subscribe to their channel. With all this growth, there are still trends that point to possible declines. The video saturation may not cause evolution but instead just mean that people are tired of all this video hitting them and stop watching. Privacy is a huge concern and people are sharing less personal information on major networks. I disconnected many social services from others. I don’t share my contacts as readily. I don’t use Google or facebook or Twitter to sign into other services if I can help it. Companies know this. facebook has disallowed me from automatically sharing posts from other networks on my profile. I keep hearing that Gen Y and Z will drive increased adoption of technology like VR and AR. But that is not what I see in my students that fall into these generational groups. Like myself, they just don’t see compelling reasons to own and use expensive glasses/goggles or add apps yet. I think it is a given that AI and mobile will continue to grow and slip into our daily lives in many almost unseen ways. You can read Hootsuite’s report on Digital in 2018 and make your own plans to join (or rebel against) the rise of social in the year ahead. On one of my demo sites that I use with clients, I do a post each month on what is happening in web design trends. It is hard to keep up as the web evolves. Certainly websites from back in 1989 look VERY different (thankfully!) from today’s sites. The new year always brings predictions of new directions for web design. Some of those predicted trends end up being fads and lasting very briefly. Here is a look at a few predictions for web design trends for 2019. Which ones will stick? The blog at bluecompass.com comes from this Iowa-based digital company that works with businesses on web design, development and marketing. Their predictions have a lot of color, animation and movement. I have to say that some of this doesn’t work for me. It is overwhelming. One trend is the popularity of long web pages and seemingly “endless” scrolling. They point to the site for magicleap.com/ which I think has too much going on. Color branding is another trend they list. Of course, using colors as prt of your branding is hardly new. It’s about as old as branding had colors available after we got past black and white newspapers, magazines, color TVs and monitors and computer printers. The example above uses multiple colors and animated backgrounds to show the colors coordinated to the beer labels – Belgian White having a yellow label, etc. Blue Compass’ own UX testing found that rather than horizontal lines, using diagonal line design is not only visually intriguing, but it creates a directional purpose for the user’s eyes to follow down the page or to point to a call-to-action. The example below from TaxiNet illustrates this trend. The blog at movableink.com has its own list of trends for 2019. One that I agree on is breaking the grid. That grid is the symmetrical, graph paper kind of balance and design that came from engineering. We like its harmony. It is logical. But it can be boring and restrictive. Broken grid layouts actually don’t use a grid, or if they do it is to be able to overlap and see where you are breaking the lines. Images, backgrounds and text elements can seem to drift into and across the gutters that we are used to having form the boundaries. This trend is great for people who never liked to color within the lines. Not animated but still striking is the use of big, bold lines that can draw attention to a point or a complementary image. With thick lines, the color(s) and intersection points pull the user’s attention – sometimes to and sometimes away from the lines creating a focal point. 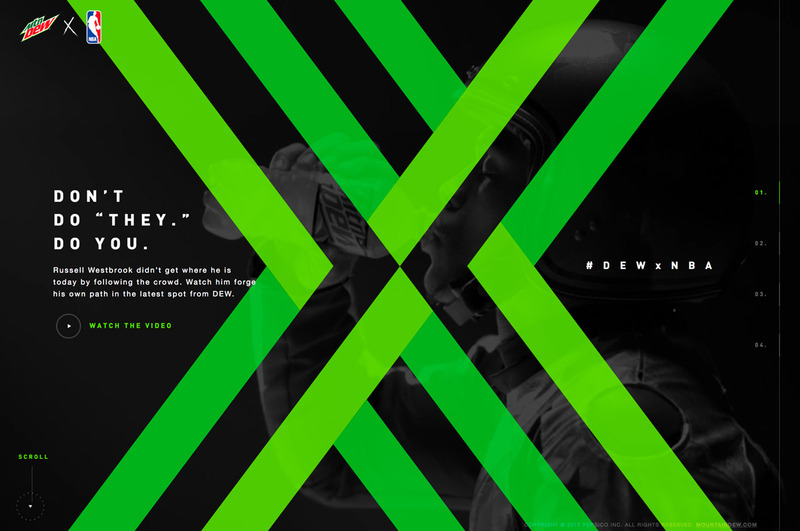 Big, bold, thick lines are central to this Mountain Dew and the NBA campaign.